Life takes root in death. It grows on the remains, and it covers up death and tells its own story again. Though it never stays the same, stances of loss might fade out but they stay, no matter how slightly visible. It can be experienced when nature and man-made world collide and intervene into each other’s realm; albeit man has been more destructive towards nature by manipulating it for his own selfish and greedy reasons. Man has been trying to shape the world and nature in the name of development, progress and prosperity, with definite political means. However, it’s more likely that nature does come back to practice its force and register its presence. No matter how destructively or peacefully it may come, it reshapes the man-made world or brings life out of death. 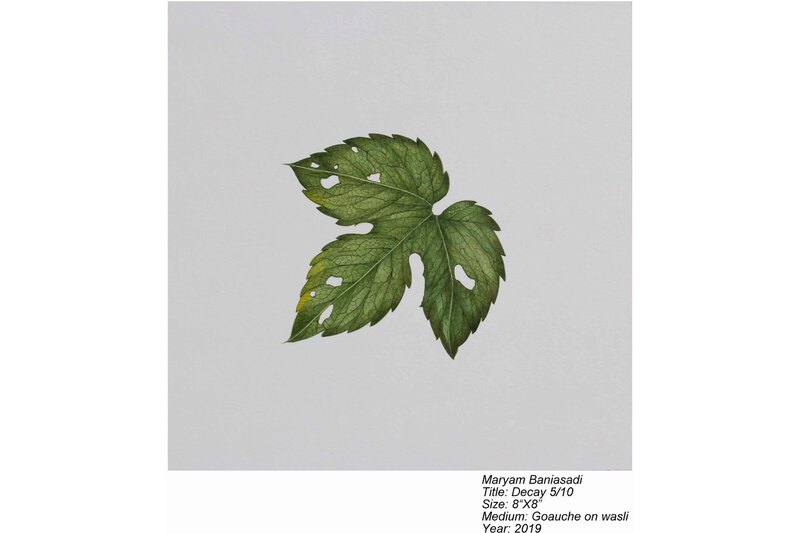 This dichotomy was observed by the Iranian artist (now based in Pakistan) , Maryam Baniasadi, in her solo show “Beyond The End” curated by Sanam Taseer, which opened on 26th March, 2019 at Taseer Art Gallery, Lahore. 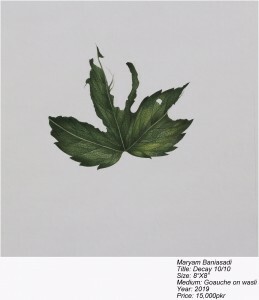 Baniasadi was interested in this paradoxical and odd relation born as a result of man being against nature. Whilst humans themselves are the creation of nature, hence part of nature, both man and nature coexist in an imbalanced harmony, where they force themselves on each other. 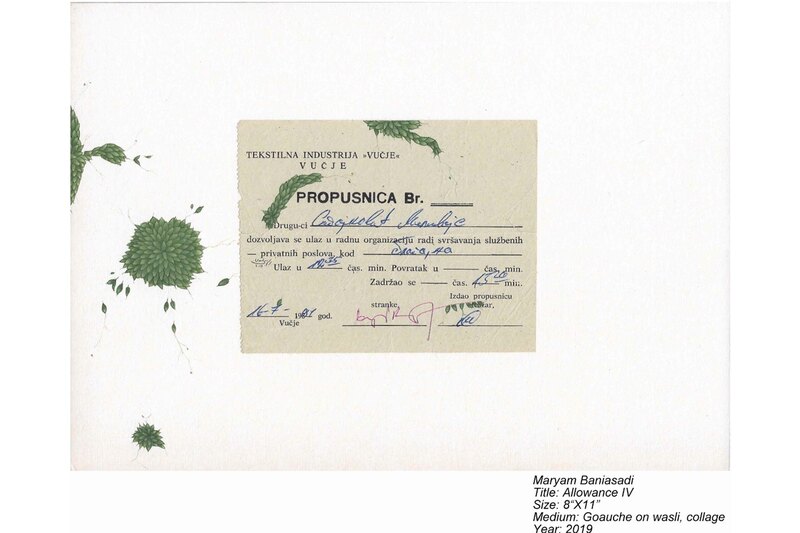 These conceptual concerns appeared in her contemporary miniaturist styled work where she worked on found objects meticulously in a traditional miniature technique. The was for the first time during her M.A. (Hons) Visual Arts, at NCA, 2017, after her BFA Degree in Miniature painting from the same institution. 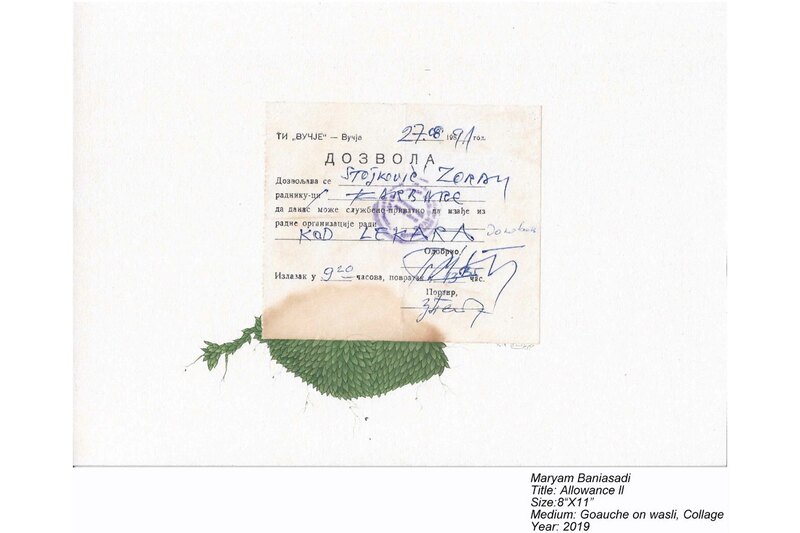 She has worked with the objects found from the factory, for example documents, ID cards, and threads which were covered with wild plantation and leaves growing out of every corner of the factory. It was like experiencing what she has been conceptually concerned about, the whole time, in real; a double-edged relation of nature and manmade world. She identifies the circle of how both reacted to each other, by saying that once it was a natural plain which was transformed into a factory by men and now it is again taken over by the nature. 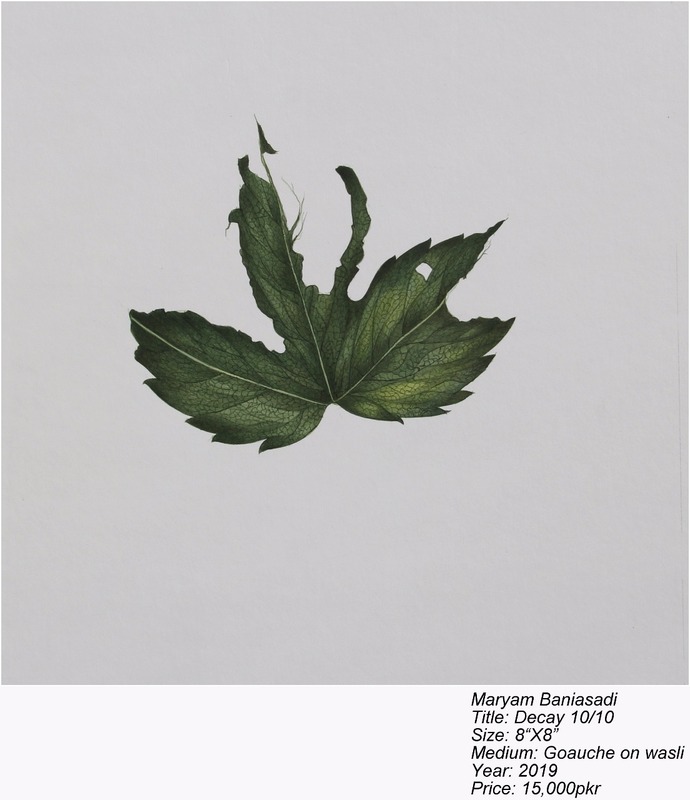 The show has 25 art pieces in total, including paintings made using miniature technique (Gouache on Wasli) of various sizes, digital prints of photographs, photomontages, and two installations with found objects. 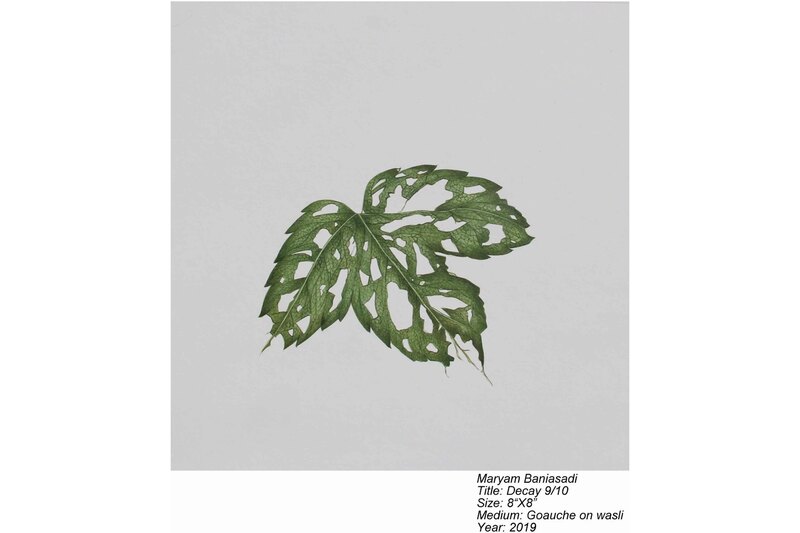 The dominating elements in her visual language are the leaves and plants intelligently mixed with found objects and for this reason, a viewer experiences a strong green colour taking over the ambience of the gallery space as one enters. However, its flip side lies in the darkness of this fresh colour which reveals itself when he/she has a closer look of the work. Thoughtful display and the lighting by the curator, takes you to every corner of the gallery, without any inconvenient visual jump. You encounter the small installation of the found object “strip code for textile machine” as you step on your right, which smoothly takes you to a comparatively large-sized watercolour painting and a small gouache painting which directs you to the small black corner which has three photomontages. 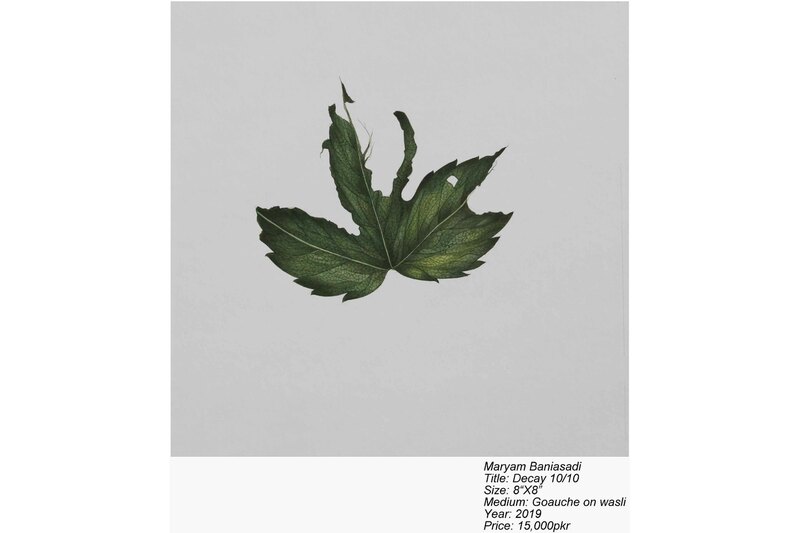 Then you have a series of small gouache on wasli, a series called Decay placed on the right wall opposite to the series of seven small paintings, titled as “Allowance”. 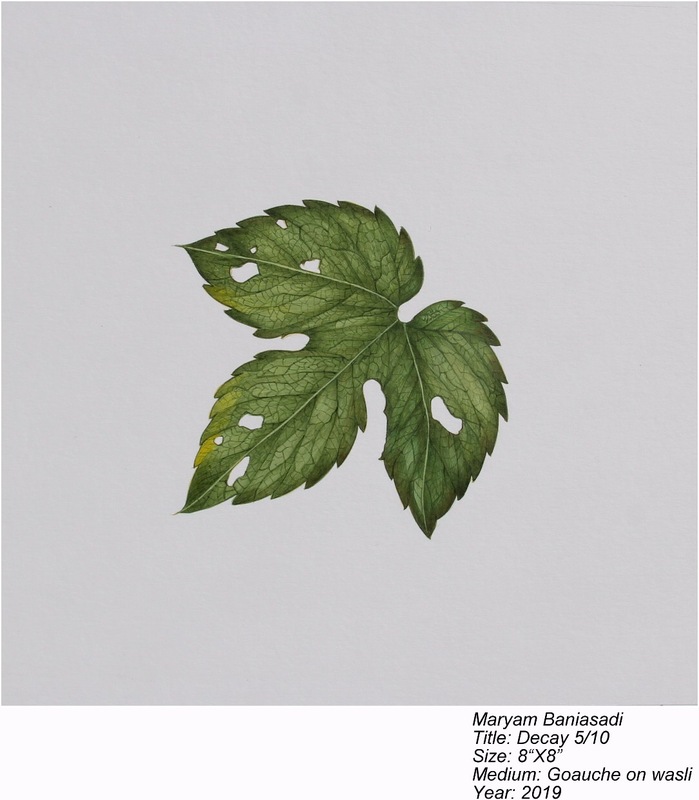 For this series, she has used old found receipts to paint on or around them, and in some cases, used their stains or torn corners that led her to the composition of dedicatedly painted small leaves. Looking at them suggests that they beautifully convey the feel that generates through the oppositional relation she felt in that small village and workplace. The front wall gets your attention with a small painting of a beautiful facade of a half-constructed building which is accompanied by her installation with ID cards of the factory workers placed on pedestal, and this takes the viewer to the last piece which is a digital photograph titled as “Threads of life”. Overall in this show, the artist has sensibly tried to bring out her feelings for nature and how it’s been shaped and reshaped by human and nature’s peaceful and low-toned warning that she witnessed in that small village, a warning that shows us what can possibly be beyond the end. The show continues till 3rd April, 2019.